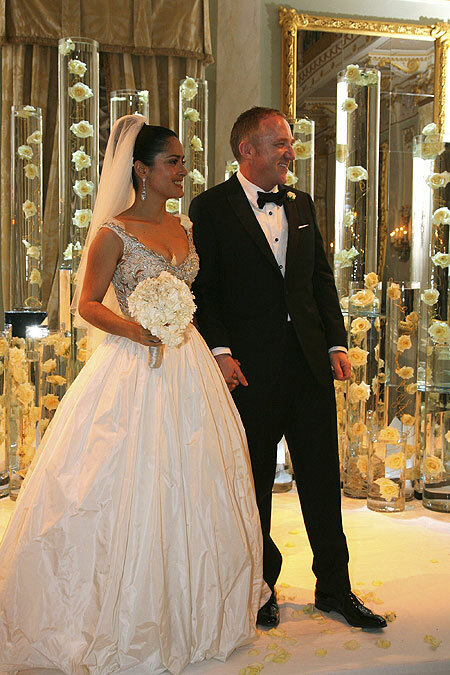 Actress Salma Hayek and billionaire François-Henri Pinault renewed their vows at a lavish wedding in Venice recently. The couple first tied the knot a few months ago at a low key ceremony with only family members present. The second wedding was a grand affair attended by many A-list celebrities from around the world. Stella McCartney, Penelope Cruz and Charlize Theron were present for the weekend of celebrations. The romantic city of Venice is particularly dear to the couple as they first met there. Salma’s bridal bouquet was a formal hand tied bouquet of white orchids and stephanotis accented with crystals and bound with ribbon down the length of the handle. Stephanotis is highly fragrant exotic flower. It is a popular choice for wedding bouquets. The flower stems are very short so they are wired into bouquets. The magnificent vase arrangements in the background are super tall cylinder vases with ivory roses submerged under water. The roses are suspended on gold wire throughout the length of the vases. Submerged flowers are a very simple but effective look. The curved shape of the vase magnifies the flowers. Cymbidium orchids also work well in submerged arrangements. Waterproof lights or floating candles can also be placed in the vase to make the arrangement appear to glow. 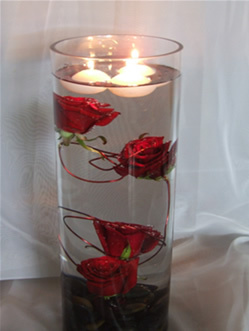 Pictured below is a cylinder vase with red roses submerged with polished river stones at the base and floating candles. 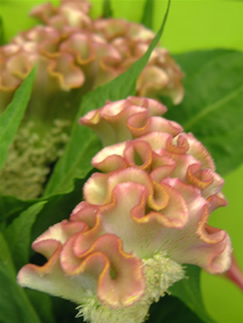 There are two types of celosia, cristata which has a crinkled, brain like appearance, also know as cockscomb celosia. The second is plumosa which has a pointed shape and feathery plume. 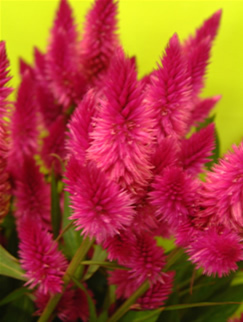 It is a member of the amaranthus family and plumosa celosia bears a slight resembalance to upright amaranthus . It is mainly available April to October. It is not very well known in the UK, but it’s amazing appearance and velvety texture always cause a stir when it is seen. It’s available in many vibrant colours such as cerise pink, orange, red, and purple, as well as some paler shades of pink and green. The leaves are normally removed, as they serve no purpose and are not long lasting. The flower has a good vase life of up to two weeks. It works particularly well in modern designs due to it’s unusual appearance. 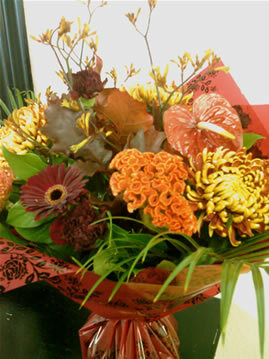 The autumnal bouquet pictured below has orange cristata celosia in it and various other textured flowers which provide a rich and varied bouquet. Every few weeks I’ll show you a wedding dress and suggest a bridal flowers that would complement it. The wedding dress is often the starting point for bridal flowers and your bridal bouquet. Your dress shows a lot of about your style and personality and your wedding flowers will also reflect this. 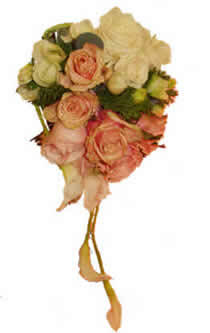 The shape, style, colour and fabric determine which bouquets would be suitable. This week I’ve have picked a beautiful Sharon Bowen dress. Sharon is well known designer based at studios in Congleton, Cheshire. Her collections are available in bridal shops throughout the UK. This dress Pink Champagne is from her Romantics collection. The flowing line of the skirt suits a teardrop shaped bouquet. The delicate layers of sheer fabric are ruched at the waist and give a vintage feel to the dress. I have chosen a simple teardrop bouquet in creams and peachy pink which are fairly traditional colours. Although the flowers are grouped in a contemporary design with modern touches such as the calla lilies circled round the bouquet. The roses, calla lilies and anemones are in warm colours which enhance the romantic champagne tones of the dress. Staying with the theme of vintage romance. For the other wedding flowers I would suggest simple arrangements using shades of apricots and pale pink and peach roses with cream callas lilies. Perhaps elegant bridesmaid’s bouquets using a few large callas lilies kept long and bound with organza down the stems. For the ceremony and reception tables, candelabras flowing with loose arrangements of roses and ivy. In the other designs such pedestal arrangements and the top table arrangement, other flowers could be incorporated in soft muted tones. Why don’t many independant florists sell fairtrade flowers? The ethos behind Fairtrade flowers is to provide better prices and working conditions for the farmers who grow and harvest them in developing countries. 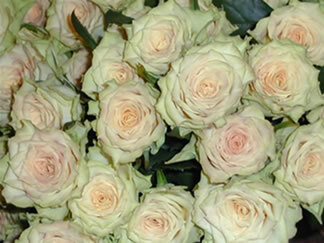 Which is a noble cause, but the vast majority of flowers in florist shops are grown in Holland. Although many people assume all flowers are from far flung places and sold via Holland. Holland actually grows many flowers itself such as orchids, syringa, anthurium, freesia, chrysanthemum, roses, lilies, amaryllis, anemones and hyacinths. Holland is obviously not a third world country, it has fair minimum wage and proper health and safety laws etc. 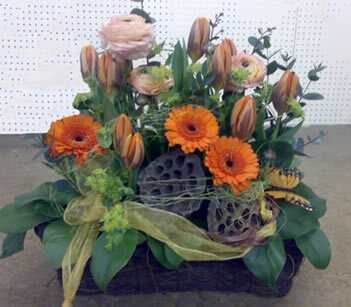 Dutch flowers also have the benefit of less air miles than flowers shipped from Kenya or Ecuador. You may have noticed that most suppliers of Fair Trade flowers are large companies such as supermarkets and the big online businesses; there is a good reason for this. The certification process to be a supplier is arduous and expensive, therefore not feasible for small independent companies. If you are interested in flowers grown in Africa or Kenya there is no shortage of supermarkets offering these. But since Holland and the UK grow many beautiful flowers, I prefer to get flowers closer to home where possible. British flowers are exquisite and I love to use them when they are available. A lot depends on the weather but they are generally available May to September. With spring flowers such as tulips and daffodils starting from February onwards. 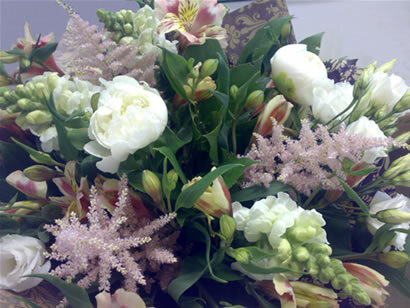 I can source English peonies, stocks, dahlias, asters, lisianthus, alstromeria and freesia. 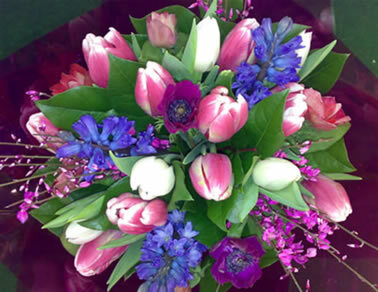 With a bouquet of English flowers you can take comfort in the knowledge you are supporting the British economy and your flowers have not been transported half way across the world to reach you.